Whether your sensor parcel sits on a slope or a flat plain – its overall profile or type – has major effects on water movement, soil composition and available sunlight. Furthermore, the specific position of a parcel on a slope or flat plain also matters. We can look at large changes across slopes in a hilly area, or small (micro) changes across a site which can indicate if water will pool or run off. This can influence, for example, the local availability of nutrients and water to plants. If you look at your country or region, you will likely find that the flatter areas tend to be used for agriculture. Slightly steeper areas might be more suitable for animal pasture. The steepest areas are most often used for forestry. Sometimes growers create flat areas to improve their growing conditions. So, is your growing area at the top of a hill, or at the bottom of a valley? Are you on a slope or flatter ground? Which way does the slope face? These are all important questions that can give important insight into the otherwise hidden flows of water, wind and nutrients. 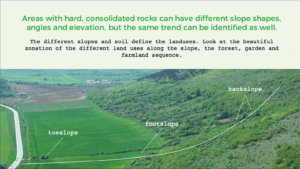 Have a look at this presentation in which Dr Endre Dobos from the University of Miskolc in Hungary, explains how to categorise slope type and position and how it affects water movements in the landscape. Slope aspect is the compass or cardinal direction a slope faces. It affects temperature, light levels, weather condition and thus processes that influence soil formation (such as erosion, deposition, and rock weathering). All of these factors have a great impact on the growing environment and conditions for plants. Use tools such as a mobile device, app, and/or compass to calculate the compass direction of the slope. Stand on the slope, and hold your device facing away from the slope in 90 degrees. This will give you the direction of the slope, whether it is e.g. a southern, or west facing slope. Look at a map (either paper or an online map) of your growing space. Usually the top of the map is north (but do check for a compass rose to be sure). Use the sun. The sun rises in the east and sets in the west. At midday (12 noon, not adjusted for daylight saving!) it will be to the south if you are in the northern hemisphere, or the north (if you are in the southern hemisphere).